Contemporary eat-in kitchen in Brisbane with a double-bowl sink, flat-panel cabinets, dark wood cabinets, window splashback, stainless steel appliances, an island, white floor and white benchtop. The window splash-back provides a unique connection to the outdoors, easy to clean and plenty of light through the day. 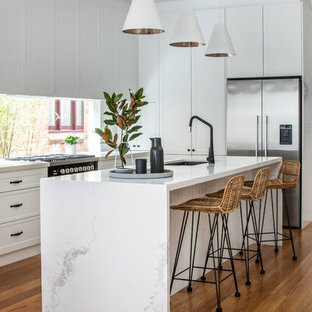 Inspiration for a small contemporary galley eat-in kitchen in Sydney with an undermount sink, flat-panel cabinets, white cabinets, window splashback, white appliances, an island, white benchtop, quartz benchtops, porcelain floors and grey floor. 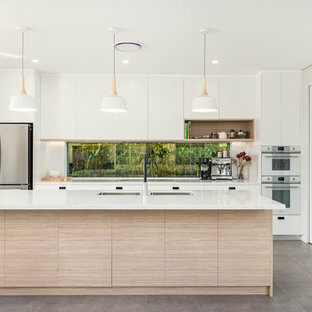 This is an example of a contemporary l-shaped eat-in kitchen in Sunshine Coast with a double-bowl sink, flat-panel cabinets, black cabinets, stainless steel appliances, light hardwood floors, an island, beige floor and white benchtop. Inspiration for a contemporary l-shaped eat-in kitchen in Sydney with white cabinets, quartz benchtops, window splashback, an undermount sink, recessed-panel cabinets, stainless steel appliances, medium hardwood floors, an island, brown floor and white benchtop. 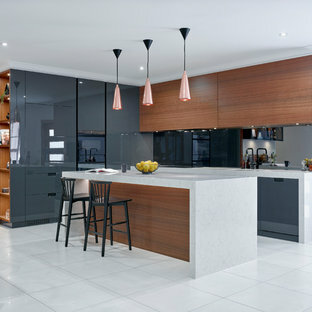 Photo of a contemporary l-shaped eat-in kitchen in Canberra - Queanbeyan with an undermount sink, flat-panel cabinets, white cabinets, grey splashback, cement tile splashback, panelled appliances, medium hardwood floors, an island, brown floor and white benchtop. Inspiration for a contemporary l-shaped eat-in kitchen in Melbourne with an undermount sink, flat-panel cabinets, white cabinets, light hardwood floors and no island. Design ideas for a contemporary eat-in kitchen in Sydney with an integrated sink, shaker cabinets, black cabinets, stainless steel benchtops, white splashback, stainless steel appliances, concrete floors and an island. 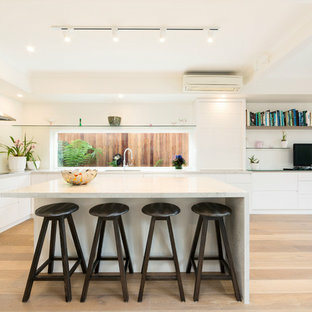 Contemporary l-shaped eat-in kitchen in Melbourne with an undermount sink, flat-panel cabinets, white cabinets, white splashback, window splashback, light hardwood floors, an island, beige floor and white benchtop. 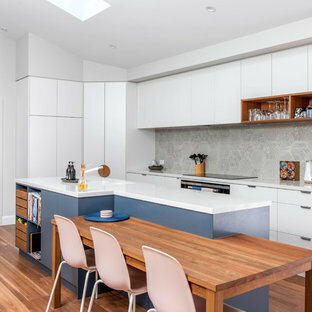 This is an example of a contemporary galley eat-in kitchen in Melbourne with an undermount sink, flat-panel cabinets, grey splashback, panelled appliances, light hardwood floors, an island, white benchtop, grey cabinets and brown floor. Inspiration for a contemporary galley eat-in kitchen in Sydney with flat-panel cabinets, white cabinets, stainless steel appliances, dark hardwood floors, an island and brown floor. Large contemporary single-wall eat-in kitchen in Sunshine Coast with a drop-in sink, white cabinets, quartzite benchtops, black splashback, white appliances, concrete floors, an island and mirror splashback. Design ideas for a contemporary eat-in kitchen in Melbourne with flat-panel cabinets, dark wood cabinets, stainless steel appliances, dark hardwood floors and no island. This is an example of a large contemporary single-wall eat-in kitchen in Sydney with an undermount sink, flat-panel cabinets, white cabinets, granite benchtops, white splashback, white appliances, light hardwood floors, an island, brown floor and white benchtop. 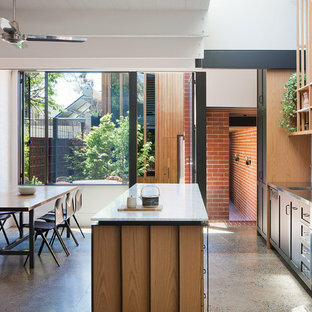 This is an example of a contemporary galley eat-in kitchen in Sydney with an undermount sink, flat-panel cabinets, black cabinets, glass sheet splashback, black appliances, an island and beige floor. 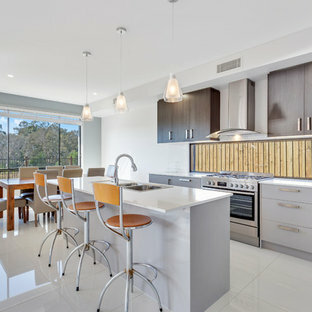 Photo of a contemporary galley eat-in kitchen in Sunshine Coast with an undermount sink, flat-panel cabinets, white cabinets, white splashback, stainless steel appliances, concrete floors, an island, grey floor and white benchtop. Inspiration for a small contemporary galley eat-in kitchen in Sunshine Coast with a drop-in sink, flat-panel cabinets, beige splashback, timber splashback, stainless steel appliances, concrete floors, multiple islands, grey floor and white benchtop. 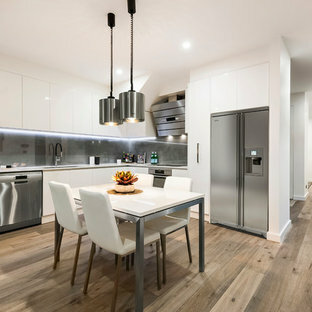 Photo of a mid-sized contemporary galley eat-in kitchen in Sydney with a double-bowl sink, grey cabinets, quartz benchtops, white splashback, glass sheet splashback, stainless steel appliances, medium hardwood floors, an island, white benchtop, flat-panel cabinets and brown floor.